Laini Taylor is an artist who created Laini’s Ladies line of gifts and stationery. She lives in Portland, Oregon, with her husband Jim Di Bartolo, an illustrator, and their daughter Clementine. She likes mangoes and chocolate. Learn more at Laini Taylor’s website. Click here for more stories by Laini Taylor. 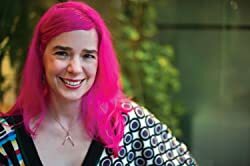 Laini Taylor, who wrote the YA fantasy Daughter of Smoke & Bone, and was shortlisted for the National Book Award for Lips Touch: Three Times, has a great smile, a winning way with an audience, a wicked sense of humor and pink hair. 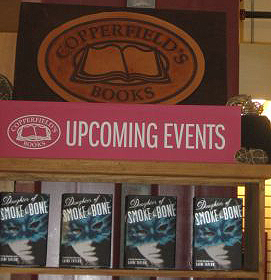 Taylor was on the last leg of her book tour promoting Daughter of Smoke & Bone when I met her at Copperfield’s Books in Petaluma, California. Taylor attended the Santa Rosa Junior College, just up the road from Petaluma, and graduated from Berkeley with a degree in English, so she is practically a local, even though she now lives in Portland, Oregon with her artist husband Jim and their daughter Clementine. Yesterday I was very lucky for the chance to meet with Laini Taylor and discuss her recently-completed DAUGHTER OF SMOKE AND BONE trilogy. Arriving in Christchurch, New Zealand for our biannual Writer’s Festival, Laini was kind enough to share some insights into her epic story. Involving a star-crossed romance, a perspective flip on angels and demons, and an upcoming film adaptation, her trilogy has ensnared thousands of readers -- and hopefully you as well. 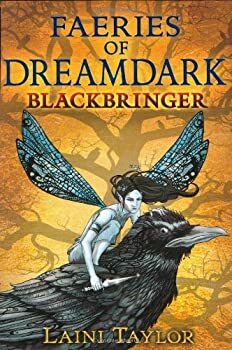 When last we left the intrepid — and tiny — heroes of Blackbringer, Magpie, Talon, and company were leaving on a task set to Magpie by the Magruwen (the Djinn King). Their mission: To find the last five of the Djinn who created the world. 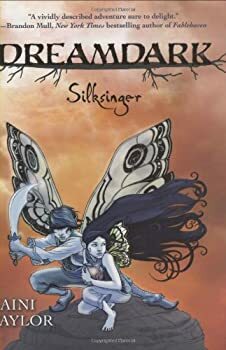 In Silksinger we meet Whisper Silksinger, the last remaining member of a clan of faeries who weave flying carpets (because they’re all “scamperers,” meaning their wings are too small to carry them). She, too, has a mission. Her clan has long been the protectors of the Djinn known as the Azazel. As the last Silksinger, she must bring the Azazel (only an ember smoldering away in a teakettle) to his throne, where he will, she hopes, awaken. It’s a burden Whisper carries alone, as she doesn’t believe she can share her secret with anyone else. 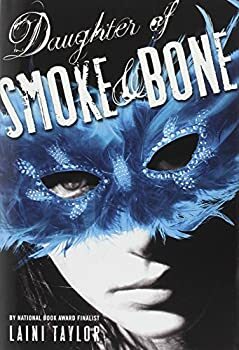 The “angels” and “devils” of Laini Taylor’s Daughter of Smoke & Bone (2011) are not quite what those words would lead you to expect, but are given an original twist. The angels are closer to the angels we know — specifically the fearsome, fiery warrior type of angel, not the gauzy kind that helps adorable children cross bridges. They differ from the popular conception of angels in that they’re placed in a religious context of Taylor’s own invention. Their enemies are the chimaera, a race of human/beast hybrids whom the angels revile as demonic. These two races dwell in the realm of Eretz, parallel to our own world, where a war has raged between them since time immemorial. 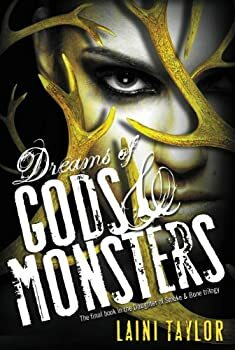 Laini Taylor’s Daughter of Smoke & Bone was one of my favorite books last year, a sparkling, quirky gem of a fantasy. Karou, with her blue silk hair and the eyes on her palms, captivated me. The mysterious story ended darkly, but it was filled with humor and whimsy. 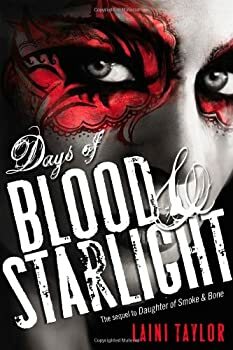 Days of Blood & Starlight has plenty of darkness, at least at the beginning. Karou has left Prague and her art student life and fled to Marrakesh, where she is helping her people, the chimaera, building magical bodies for their spirits to inhabit. Karou is grieving the murder of her family and the immolation of her love affair with Akiva, a seraph – the enemy of her people. What do you get if you cross Paradise Lost with Romeo and Juliet? 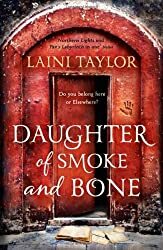 Laini Taylor’s DAUGHTER OF SMOKE AND BONE trilogy, a story that centres on an epic war between angels and demons with a pair of star-crossed lovers caught in the middle. Only the angels and demons aren’t exactly what you’d expect. In the world of Eretz, “angels” are winged humanoids known as seraphim and the “demons” are half-human, half-animal hybrids known as chimaera. Their conflict has been going on for centuries — and has finally spilled over into our world. For years Laini Taylor’s been a favorite here at FanLit, and now I know why. 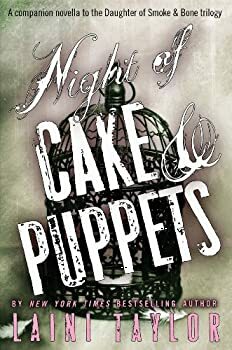 I picked up Night of Cake & Puppets, a stand-alone novella set in Taylor’s DAUGHTER OF SMOKE & BONE world, because it was short and available on audio at exactly the length I needed for a recent car trip: two hours and forty-five minutes. Perfect. That’s not all that was perfect about Night of Cake & Puppets. Everything was perfect about Night of Cake & Puppets. Well, except I wish it had been longer. Longer would have been perfect. 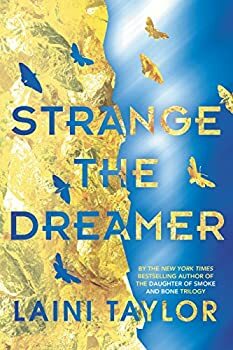 On first look, it might seem that Laini Taylor was a little too ambitious with her latest offering, Strange the Dreamer (2017), kind of like an overenthusiastic cook that goes a bit overboard with their cake ingredients. The blurb doesn't help matters, citing a war between gods and men, a mysterious city, a mythical hero, a librarian, alchemy, nightmares and monsters as some of the components of the story — which will no doubt have raised an eyebrow or two. But just like its protagonist, Strange the Dreamer is far from what you first expect. 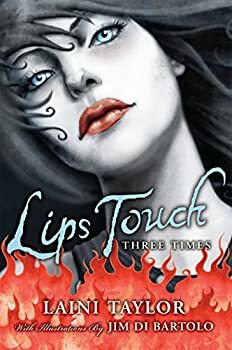 I'm having a hard time reviewing Lips Touch: Three Times. Intelligent language seems to be failing me. I don't want to write a review so much as I want to jump up and down and squeal like a crazed fangirl. Lips Touch is chocolate in book form. It's dark, it's rich, it's delicious, and it's precisely to my taste. Lips Touch is a collection of three stories; the common theme, as you might guess from the title, is the kiss. In fairy tales, a kiss is often the catalyst for transformation. Laini Taylor is, without a doubt, writing fairy tales here. From the threads of older stories, she weaves new tales that have all the power of the old.